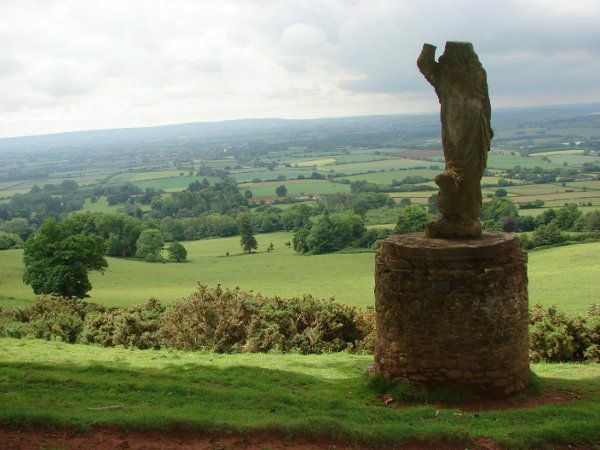 Undoubtedly one of the most stunning views from the Quantocks is that from above Tilbury Park in West Bagborough. Driving down from the Lydeard Hill car park towards West Bagborough, there is a pair of fine stone gate piers on the left and just beyond is a field gate giving access into the steeply sloping field from where there is a magnificent view south across Cothelstone Park towards the Blackdowns and the Wellington Monument. Not far from the gate is a stone seat and canopy surmounted by a statue of Jupiter. This is a park ornament of the former Tyrhill House, once a fine mansion built in the later 18th century by one Thomas Slowcombe but now demolished. In 1994 the statue fell and for several years lay on the grass but in 1999 the seat was restored and the statue re-erected by Friends of Quantock, largely thanks to generous donations from the family of Heather Cavell, who is commemorated by a plaque on the back of the seat. This winter the plaque fell off but was rescued by Mr Cavell during a visit and has now been put back by Friends of Quantock. 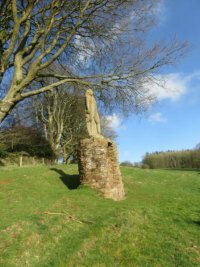 The seat and statue are on private land but the landowner, Hugh Warmington, kindly allows people to go into the field to admire the statue and its amazing view, only asking people to keep the gate shut and respect the seat and pasture.